Settlers of Catan is a multi player board game in which the players contend to efficiently colonize a new land called the island of Catan. Every game requires about one hour to play. It can be played by anybody of age 10 or more. It's a wonderful game for board game lovers as the game is an ideal mixture of strategy and chance. The rules are pretty easy and fast to learn. 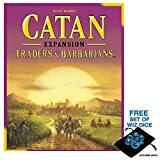 Additionally, there are a couple of important expansions (Seafarers of Catan, Cities and Knights and Traders and barbarians) which include each extra units and rules. There are also expansions to which allow you to play with 5 to 6 players at the same time. The game was created and produced by Klaus Teuber and first released in Germany in 1995. It became well-known and successful quite fast. It won that year the prize of German Game of the Year. The next year, Settlers of Catan became known worldwide and won the title of game of the year even in the USA. Today, the game is available in more than 25 languages. 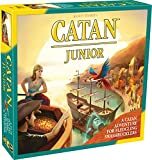 The last years, we see also many spin offs like Kids of Catan, Starship Catan, Rivals of Catan, Catan Junior, Merchants of Europe and the Settlers of Catan card game. The Settlers of Catan has been probably the most commercially successful Eurogame of all time. The island of Catan consists of 19 terrain hexes. The goal is to settle the island and expand your territory to become the largest player. There are 5 productive terrain types and one desert which don't produce anything. A player starts the game with 2 settlements and 2 roads. Each settlement is worth 1 victory point. The first player to acquire 10 victory points wins the game. To gain more victory points, a player can build new roads and settlements or upgrade them into cities. Each turn, a dice roll determines which terrain hexes produce resources. These resources are needed to build or to upgrade. Only if you own a settlement or city bordering the terrain hex, you will collect the resources. Therefor, settlements or cities can harvest from 2-3 terrain types. You can trade with other players if you can not harvest all different resources. This is specially needed at the start of the game. Only on unoccupied intersections can new settlements being build if you have a road leading to that place. Consider carefully where you build your settlements.